Development: Words, Nicholas’ sounds have grown leaps and bounds this quarter. We were reminded that back in February he only made a ‘ba’ and ‘ma’ sound. There were slight differences in the many uses of ba that stood for everything from brother to bottle to airplane. Now he has a string of sounds and is regularly using two words together. His first two word saying was “more food”. Right now he loves to run through a door and yell “elloo, bye bye” to mimic a silly game he plays with Cooper where he runs up to the neighbors and says “hello, goodbye” before running away again. 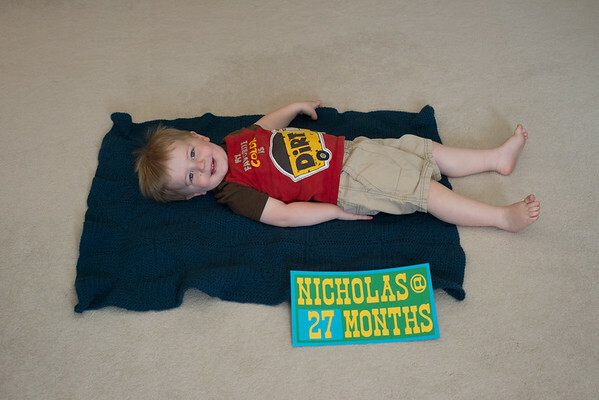 Nicholas has finished up his first solo year and 3rd year at Woodinville Toddler Group. He was able to parallel play in different rooms than me and always loved any of the ride or push toys in the hallway. He is starting preschool at Kindering where he will get his speech and occupational therapy during class. It is two days a week for 1.5 hours. This will be a great developmental milestone as he moves to a group setting for therapy and gets to blossom on his own without supervision of his parents and brother. He is always so excited to get to talk about his day when asked at the dinner table. Right now there is a lot of translating by me so it will be fun to decipher what happened on his school days. Routine: We have added a clock that turns green at 6:20am to his room to match Cooper’s. Many mornings he is up closer to 5:30am, but we are trying to see if he can wait until 6:20. On the mornings that he does wait until his clock is green he is so proud to show it off when we go to get him. 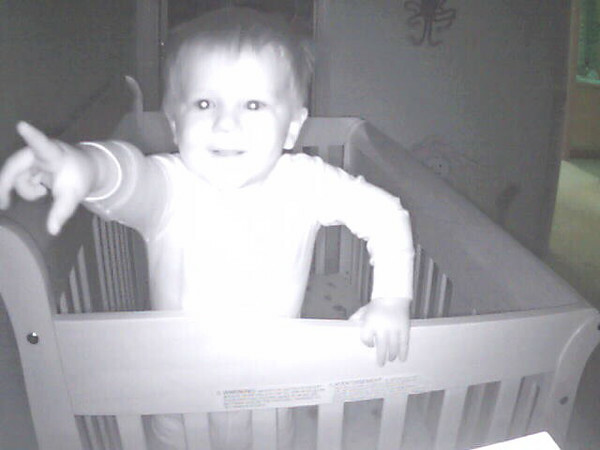 This morning he actually made it until his clock turned green and was so excited he is pointing to it on his bookcase next to his camera. Speaking of proud, Nicholas really lights up when he does something he is proud of. It is so cute to see him glowing from ear to ear when showing us a puzzle he did or picture he made. If they make it until their clocks are green they get to watch some tv in the morning while we finish up getting ready (Rob and I get up at 5:30 to try to be ready before they are up). Nicholas can last for a few minutes of tv, but quickly enters our room to keep us on track so we can get downstairs to make him some breakfast. He is at a wonderful stage of wanting to do things himself. His breakfast jobs are to get out 3 spoons, transfer his yogurt to a ramekin and stir it up, and put 2-3 prunes on both of their plates. He now regularly climbs into his booster chair at the table and does both buckles. He is drinking his milk from a rocks glass and we are slowly moving away from other plastic dishes (no real reason we haven’t switched completely, but habit). Please note how much yogurt actually made it to the ramekin. 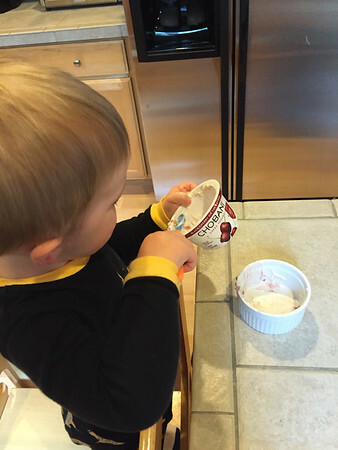 The yogurt often touches the ramekin, but is then quickly scooped up again to go right into his mouth. For snack Nicholas will get out the cheese sticks or circles for him and Cooper and bring them to the table. 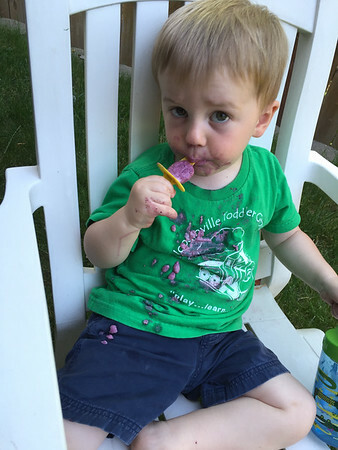 He loves Craisins and calls them “du dus.” He also loves the squeeze pouches. We then head out to play at either our weekly PEPS play dates, toddler group, the gym care or parks and errand running on our unscheduled days. Nicholas typically eats a PB&J sandwich for lunch with a fruit and pirate booty. If he sees a lunch meat or cheese he will also ask for that too. After lunch he goes up for nap and we do a diaper change and read two books before he goes down. He is currently sleeping 2-3 hours most days and we are finding if we can get in his room when he is sitting up, but before he starts to cry he is much happier in the afternoon. On the days he does cry after nap it can take some time to settle him down, but a sure bet is to sit with him in the rocker and snuggle him slightly laid back. He often falls back to sleep this way. I love his koala hold that he gives before and after rest times, it is the best feeling. If you ever need a stirrer, Nicholas is your guy. 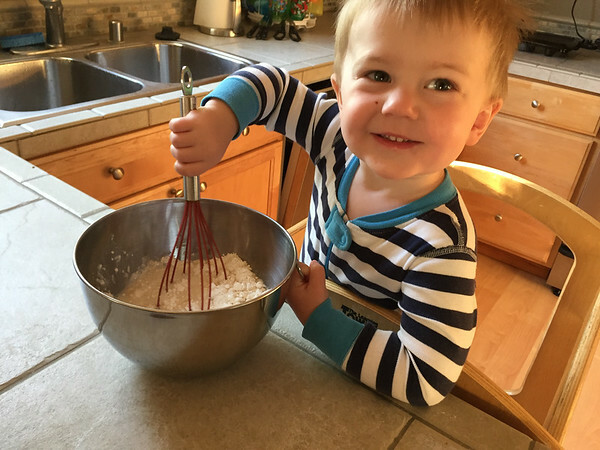 Just like his Daddy, this guy love to stir! It is hard to say no to this face when he wants a Popsicle. Eating them outside is a definite must!